Close to 50 Members of Parliament are planning to travel to The Hague to join friends and relatives of Deputy President William Ruto at his trial next month. The trial which is scheduled to begin on September 10th will see the Mps accompany the Deputy President in what they term as a ‘’show of solidarity’’. The leaders will travel in four groups over the course of the first three weeks of Ruto’s trial. The MPs are currently registering themselves in Nairobi. According to one of the Mps, One group will accompany the DP to The Hague while another one will accompany him back home. The first sitting will run for three consecutive weeks before resuming after a ten-day break. This means the Mps will be spending these three weeks at The Hague. 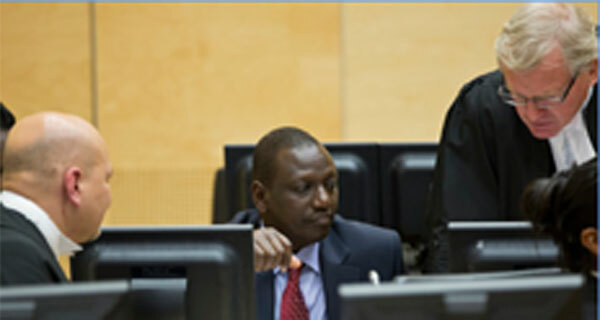 Analysts have already sounded the alarm over a possible paralysis in government when the trials of President Kenyatta and Deputy William Ruto at ICC begin. According to them, the proceedings at The Hague will inevitably the attention of the nation and it could be one of the greatest tests for the Jubilee administration. This warning and now with this massive number of Mps travelling to The Hague could just make things worse. Their absence will greatly affect their work, enough reason for them to reduce their number. We hope the government will not be paying for their travel expenses. Deputy President William Ruto together with radio journalist Joshua Arap Sand are facing charges of murder, deportation and persecution in the greater Eldoret area. This was in the early part of 2008 during the post-election violence which left more than 1,000 people dead and 350,000 displaced. “Fatou Bensouda: You Can Either Redeem the Future of the ICC or Go Down the Annals of History as the Last Chief Prosecutor of that Court!” – Moses Kuria. 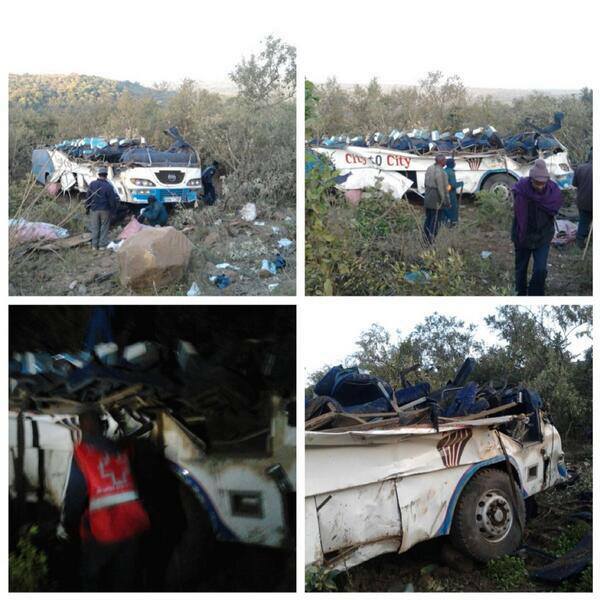 The wreckage of the bus which was involved in a tragic road accident along Narok- Nairobi Highway and killed 41 people on Thursday morning. At least 33 others have been taken to hospitals in Narok and Kijabe. According to the Police at the scene, the accident happened at about 2 am when the bus crashed into a valley as the driver negotiated a drift. 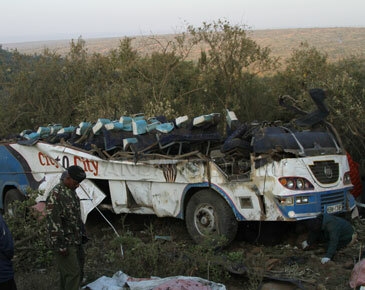 The bus belonging to City to City company was travelling from Nairobi to Homabay. Among the dead are four children, say the police. Even as this happened, another accident has also occured along Narok-Bomet Road involving two cars and a lorry, six casualties reported. This is according to Kenya Red Cross. Just what is happening to our roads? who is to blame for this? one of the survivors, while speaking to journalist in hospital said that at least five men were standing in the bus. “As a Cardinal Pillar, Kenya Must Be a Leading Participant in An Integrating Africa that is Shaping Out as a Globally Indispensable Source of Raw and Value-Added Materials for Industries and Consumers in Asia; This is in Addition to the Traditional Markets of Europe and North America; China is Important to Our Trade and Investment and Infrastructural Development; But so, Too, Are India and Singapore, Russia, Ukraine and Belarus, and Others in the RIM and BRICS – Such as Brazil and South Africa!” – President Uhuru Muigai Kenyatta. If we must , celebrtate the other heroes too . Alexander Chagema's wordpress blogs . On august 22 every year since 1978 , kenyans have been marking the day with ceremonies at the founding presidents gravesite , opposite parliament buildings . On that fateful day in august of 1978 , the founding president exited the stage peacefully . Given what he went through prior to becoming president , the challenges of steering the nation onto the right path without precedent , holding the fabric of the country together for the duration of his reign , i do not begrudge the late president his honour in death now and in years to come , but do kenyans have to celebrate it every year ? It should be noted that the late presidents efforts were not solo efforts and would not have come to fruition without the input of others like Bildad Kaggia , Kungu Karumba , Achieng Oneko , Paul Ngei , Jaramogi Oginga and Fred Kubai among others . But how often do we ‘celebrate’ or even deign to remember these gallant heroes as a nation for their selfless efforts in trying to make kenya a better place ? The history of Kenya is incomplete without a mention of Dedan Kimathi yet not a single day has been set aside to remember him and his tribulations in the struggle to free kenya from the grips of colonialists . Untill a couple of years back , his widow , Mukami , was an unknown who lived in squalor . She is still not even decently housed and featuring her at the Madaraka day’s celebrations is too little too late , even insulting . Do we even know where Kimathi was buried , if at all ? We should take a cue from president Uhuru Kenyatta who chose not to be present at the celebrations honouring his fathers death , thirty five years on . The business of nation building took precedence over festivities that are perfunctory and inconsequential . That ought to be a private family affair , away from the glare of media cameras , that does not dig into state resources . The government should not expend too much energy in organizing such events at the tax payers expense . The calls for a referendum continue to intensify from both sides of the coalition. In a recent function at Riagongera Primary School in Bomachoge Chache constituency during the homecoming party for Kisii County Deputy Governor Joash Maangi, Deputy President William Ruto and Bomet Governor Isaac Ruto clashed publicly yet again over the same issue. The referendum calls started when the former prime minister called for a referendum to be held before the next general elections. According to Raila Odinga, devolved governments will not be effective if some articles of the Constitution are not amended. He said some constitutional clauses needed amendment to enable devolution to be effective. Last week on Tuesday, the Orange Democratic movement resolved to support a national referendum to establish the percentage of the national budget allocated to counties at no less than 40 per cent. “We have noted that so far resources budgeted for the County governments fall far short of the needs of counties to implement their projects and programs for development to meet the needs of the people,” said party Secretary General Anyang Nyongo. “The party will support a national referendum to establish the percentage of the national budget allocated to counties at no less than 40 per cent and to strengthen the role of the Senate to be an effective House representing the counties,” he said. Governors, led by the chairman of the Governors council vowed to push on with their referendum agenda even as the Jubilee Coalition is opposed the move which has lately kicked off a stormy debate. 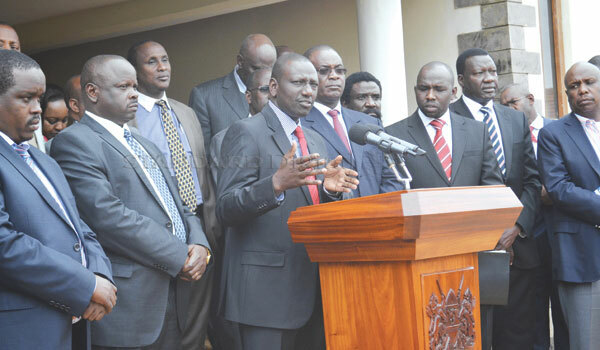 The debate has also caused a split among Jubilee Governors. Governors allied to President Kenyatta’s TNA have abandoned the campaign but county chiefs from Deputy President William Ruto’s URP vowed to soldier on. The Deputy President William Ruto on the other hand has said calling for a referendum is a waste of resources and time. A section of religious leaders have also added their voice to this debate. They are opposing calls for a referendum on the Constitution saying Kenyans are not ready for another poll. Led by Archbishop Amos Kabuthu, African Independent Pentecostal Church of Africa (AIPCA) leaders said the country does not have the money to hold a referendum. AIPCA Women Council Chairperson Bertha Mwangi said another election would polarise the country as Kenyans are yet to heal from the effects of the March 4 polls. “It was just the other day that Kenyans went to the polls. Leaders should not call for things that will poison the minds of Kenyans. We must work towards uniting Kenyans and fostering development,” she advised. Supreme Council of Kenya Muslims (Supkem) Secretary General Adan Wachu said the council was opposed to the issue of a referendum barely five months after the General Election, terming the move expensive and uncalled for. Even as the debate continues, questions arise. Are the calls timely? Will a referendum affect the country’s stability? Are Kenyans ready for it? Was the JSC justified to reject Justice and Legal Affairs Committee order for summons? 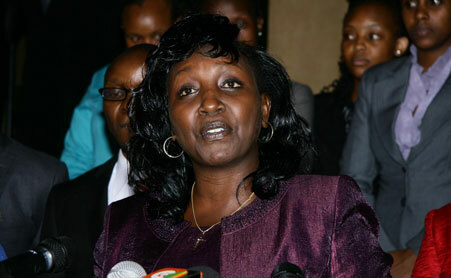 Chief Registrar Gladys Shollei addresses the Press outside the Supreme Court after she was sent on leave on August 19, 2013. There appears to be a showdown between parliament and the Judiciary over the controversy surrounding the sending off of Chief Registrar of the Judiciary Gladys Shollei. The Judicial Service Commission (JSC) yesterday indicated that it will not honor the summons issued to them appear before the National Assembly’s Justice and Legal Affairs Committee on Thursday. In a meeting chaired by Chief Justice Willy Mutunga at the Supreme Court, the JSC agreed not to honor the sermons. Sources from the Judiciary said JSC cited the need to safeguard its independence and separation of powers as set out in the Constitution is what led the JSC into coming up with that conclusion. Honouring the sermons could therefore be infringing on the JSC independence. Earlier on, members of the parliamentary committee led by Committee Chairman Samuel Chepkonga warned JSC of consequences of failing to appear before Parliament on Thursday as scheduled. According to the chair, summons had been sent out to individual members of the JSC. The parliamentary committee wants the JSC and three of its 11 members to shed light on allegations made before it by Shollei, who was sent on leave last week. Shollei was sent on a 15-day forced leave by the JSC pending investigations into allegations of financial impropriety against her. Question is, should the JSC honor these summons? Particularly after Shollei admitted to strained relations with the outspoken member of the commission, Ahmednasir Abdullahi, Judge Mohammed Warsame and Chief Magistrate Emily Ominde.